Once a place famous for the Nawabs of Awadh, the city of Lucknow as we all know is the charming capital of Uttar Pradesh. Vibrant culture, rich heritage and unique Lucknowi cuisine draw many of us to explore this beautiful city. Here is an enticing piece of architecture of the Nawab period, the Chota Imambara in Lucknow! Chota Imambara is located around 2 km from the famous Bara Imambara. It is on Husanabad Road in Daulatganj in Lucknow. An imambara is basically a congregation hall for Shia Muslims. Imambaras are also called ashurkhana, imambaragah or hussainia where religious ceremonies (mainly Muharram observances) happen. Imambara is not exactly a mosque and weekly Friday prayers might not take place in some imambaras. Chota Imambara is an imambara which was built by Nawab Muhammad Ali Shah in 1838. It is one of the beautiful historical monuments in the city of Lucknow. Chota Imambara, which is also named as Imambara Husainabad Mubarak, also has the mausoleum of Muhammad Ali Shah and his mother. Chota Imambara Complex consists of Chota Imambara, Tomb of Princess Zinat Algiya, Husainabad Mosque, Satkhanda (watch tower) and Naubat Khana (ceremonial gateway). Chota Imambara has two halls, Shehnasheen (a place where Zarih of Hazrat Imam Husain has been kept) and Azakhana. The imambara has five doorways and the exterior walls have been carved with Islamic verses. One interesting feature is that of the exotic chandeliers and glass lamps that adorn Azakhana. It is said that these chandeliers were brought from Belgium to mainly decorate the interiors of the Chota Imambara. Hence, the imambara looks splendid with all the lights lit up during special occasions. In fact, it is because of these crystal lamps and chandeliers that it got the name 'the Palace of Lights'. 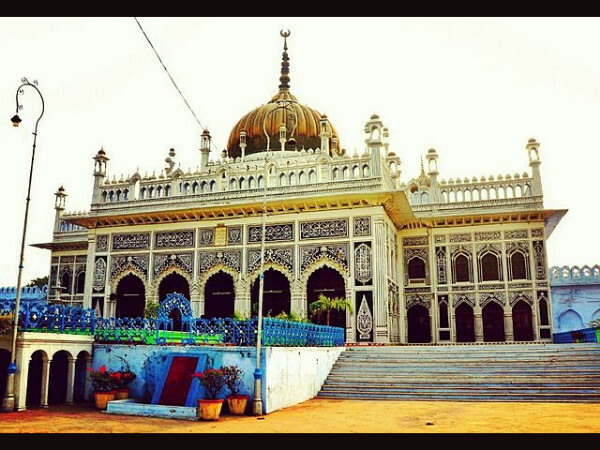 Another interesting structure of Chota Imambara complex is the Tomb of Princess Zinat Algiya. Although known as the Tomb of Princess Zinat, it has four more graves. One is of princess Zinat Algiya (Muhammad Shah Ali's daughter), another one is of his son, two other graves are of his sons-in-law and one of the Nawab's consorts. Interestingly, this tomb is a small replica of the Taj Mahal in Agra. Satkhanda is an incomplete watch tower structure which was the brainchild of Nawab Muhammad Ali Shah. He wanted this watch tower to be similar to Qutb Minar or the Leaning Tower of Pisa. Unfortunately, the construction was stopped after his death. Chota Imambara with so many unique heritage structures is one of the must-visit places in Lucknow. One can also visit Bara Imambara and Rumi Darwaza along with Chota Imambara.